This is a 7-bedroom, 5 full bathroom, 3-story home on the Bay (west) side of South Padre Island, Texas. This house is perfect for groups from five to fifteen people. The home is equipped a full kitchen, 2 large living areas, HDTVs in every room, and private balconies. Our rental in located near all of the best dining and entertainment on South Padre Island. Each floor has balconies on both the front and rear of the house. There are two master bedrooms. In total, there are 8 beds in this house. Entire house is accessible. Maintenance, management, and service staff are available on call, 24/7. This is a quiet residential area on South Padre Island. We ask that you are courteous to the neighbors. The house is centrally located on South Padre Island, meaning you are only a few minutes from most activities, dining, and nightlife on SPI. Cars a recommended, however there is a free bus service on South Padre Island (SPI Metro) that will get you within a few steps of most places, and the island is also very bike friendly! This is a quiet residential area on South Padre Island. We ask that you are courteous to the neighbors. The house is centrally located on South Padre Island, meaning you are only a few minutes from most activities, dining, and nightlife on SPI. At first, I was nervice and skeptical about using an app for a vacation and the house seemed to good to be true. Throughout the whole process, Hershel was very accommodating and quick to respond to my questions. The house was very clean and spacious for everyone. LA Copa is also a hotel chain so it's affiliation came with them calling me each morning if I needed room service ( I didn't use but the call was pleasant). When I arrived we had to do an inspection and everything seemed perfect. The only thing I noticed was that the service for the television in the main living room wasn't working. When I called someone arrived within minutes and had it fixed. I would definetely recommend to anyone as well as stay here again. The beach house was beautiful! Very clean & spacious. It was way bigger than I expected! The rooms were filled & right next to each other but we couldn't hear anything from one room to another. Everyone slept very comfortably. There was plenty of parking for my family. I will definitely book this house again in the future! Big house that's accurately depicted in each of the photos. Nice and quiet neighborhood that's a short walk to the beach. 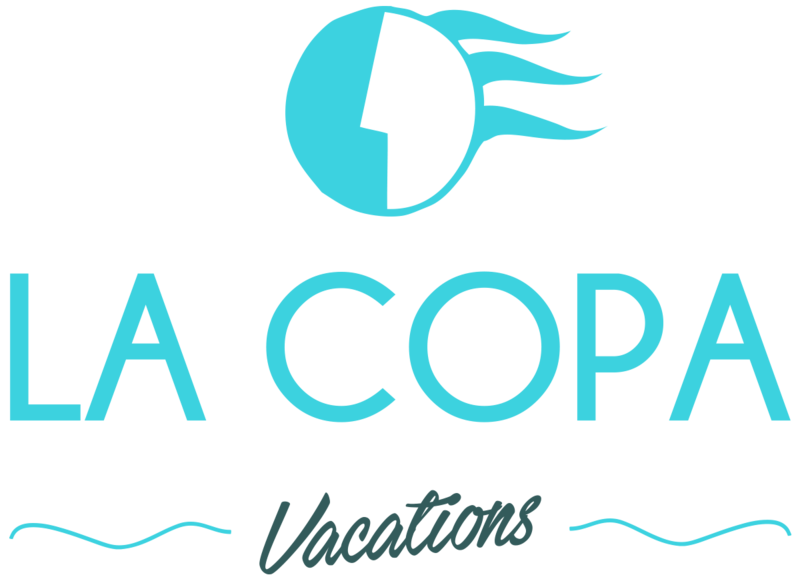 La Copa was very helpful and accommodating with our stay. Highly Recommend to anyone with a big group! Great floor plan suitable for large reunions. Three floors provide lots of space. Rooms are good sized and the two large master suites. All rooms are equipped with LCDs. There was a 27" iMac for use. The air-conditioning , wifi and TV-programming worked well. Nice furniture. We also got free breakfast for all at La Copa Inn! The place was clean and exactly as it looked in pictures. There was ample sitting areas for all. The only negative was distance to beach and not enough silverware, plates, glasses etc. We would recommend this place to anyone who doesn't mind its distance to the beach. Amazing house! It was much nicer and bigger in person. The beds were so comfortable and the house was very clean! Daily housecleaning was such a luxury to have! This was a perfect house for our large family! Host made us feel welcome. It is a spacious beautiful space. Items in the house are very limited. Great experience, loved the house. Would gladly recommend it to anyone! Our stay was great. 12 people had more than enough room to sleep. The house was even more beautiful in person than the pictures portrayed. If we do another padre trip this will definitely be our spot. This was a great house. A few coworkers and I rented this place out for the weekend and everyone was wowed. Enormous rooms, fully furnished and everything was close by. We will definitely be back soon! This home was absolutely Amazing. We had a large group and there was more than enough space. The company is very professional and friendly. The home was cleaned and my group and I were very impressed. If you're going to stay in Padre I suggest you choose this home. So glad we booked this home for Memorial weekend. Not a bad location, my younger cousins ages 4-12 had no issues walking to and back from the beach. Will book again, worth ever penny. Me and my group had a good time here! We thought it was really nice how many balconies there, and also that there was a free housekeeping service included. We did have a little bit trouble finding the third floor, because of a cool little bookcase that also serves as a door. The location was perfect. I would highly recommend staying here. From the check in, to the stay and check out, the staff was wonderful and the condo is amazing. Pictures do not give it justice, I promise the moment you walk in you will be in awe of this place. My family and I talked about how we will be going every year to padre and how we plan on using this condo every time. Oh and btw, their hot breakfast is amazing. Perfect experience! Thank you for giving my family and I a wonderful experience. We were surprise to find that the house is actually bigger than what the pictures showed. We were 2 families traveling as a group of 12 and there was plenty room for all of us. The house was clean and the a/c worked great. It is not right on the beach but the island is small enough that everything is easy to get to. The La Copa Inn provided a free wonderful breakfast every morning and that was a huge and wonderful added benefit. We only had 2 issues... first, we did not have hot water in some of our upper bathrooms. We told the management twice and they sent someone out but no luck in the upper rooms. If you will need all the bathrooms keep that in mind. (Our lower bathrooms had hot water). Also, the dishwasher seems to be on its last legs so you may want to buy dishwashing soap for your dishes. The kitchen had everything we needed to have a meal a day at the house and the beds were very comfortable. Overall it was a great stay for the amount we paid. Great huge house. Free breakfast and every day maid service. Would book again!